...Canada’s process to replace its CF-18 fighter jets stands as one of the strangest in the country’s history. It has witnessed four major decisions on the purchase of new fighter jets: in 2010, 2014, 2016 (for interim Super Hornets), and 2017 (for surplus Australian jets). Notably, the first three decisions were cancelled. Even as the auditor general weighs in on the last episode, the current process to permanently replace the CF-18 fleet with 88 aircraft has avoided serious scrutiny. Like the interim buy, the entire process is fundamentally flawed and likely to produce a significantly poorer outcome for Canada. The Liberal government’s fundamental flaw is that it has sought to oversee a fair competition where none is possible. Of the airframes considered, the F-35 offered the highest capability (by a significant margin) with the lowest lifetime cost, and due to its high international production rates (twice as many units as any of its competitors) has industrial benefits far exceeding Canadian offset requirements. Many other nations have come to these conclusions; internationally, the F-35 has not lost a competition. In many cases, governments simply sole-sourced in order to avoid the potential expense of a competition with a foregone conclusion. In Canada’s case, the government has not sought to select the right option, but rather to create a vehicle for building political capital, using the façade of a fair and transparent competition process. I don't know why the article would 'disappear behind a paywall' if it is already available for free online; 3 page PDF below. It's just as well then that the US bought Alaska off Russia and that it is on the left hand side of Canada facing Russia . Puff Pieces about how great the Canadian Fast Jets are today but YMMV - you may be Canadian and I'm sorry about that. Royal Canadian Air Force Review Today pp52 2018 reprinted [PRN] with some 80 pages about ASW & Helos removed. spazsinbad wrote: Puff Pieces about how great the Canadian Fast Jets are today but YMMV - you may be Canadian and I'm sorry about that. That is just so sad. "What the billions are being spent on is a mystery. A footnote is the only hint, suggesting the provision is for “anticipated Cabinet decisions not yet made and funding decisions related to national security, commercial sensitivity, trade agreements and litigation issues.”"
Trying to keep track of every dollar Ottawa spends is a pseudo-science like the one practised by crypto-zoologists looking for Bigfoot — only the gullible would ever believe in a happy outcome. Take last week’s fiscal update. To much fanfare, it announced $16.4 billion in new spending measures, principally the $14 billion on accelerated investment incentives to address competitiveness. That money is now built into the fiscal framework, adding to the deficits that disappear over the government’s planning horizon. Pierre-Olivier Herbert, press secretary to Finance Minister Bill Morneau, proved he has a sense of humour when he suggested the Liberal government has “set a new bar for transparency” in its financial statements. It is true that the Trudeau government provides information on what happens between fall statements and budgets in a way its Conservative predecessor did not. But the former parliamentary budget officer, Kevin Page, worked at the Department of Finance in the 1980s and the Privy Council Office in the 1990s, and does not recall any previous government adjusting the fiscal framework without telling people what it is doing with the money. Herbert said the details will be released in due course — it is understood that the supply management package that will compensate dairy farmers for loss of market share due to the United States-Mexico-Canada free trade deal is included in the aggregate amount. But the opposition parties are not happy about the way the government is announcing — or non-announcing — such a large, fiscally material spending plan. Daniel Blaikie, the NDP’s Treasury Board critic, said it is understandable for any government anticipating a large expense, such as the settlement of a collective agreement, to budget for it while not disclosing the amount during negotiations. But these measures have a five-year time horizon and provide no details for MPs to judge whether the spending is appropriate or not, he said. He noted that the $516 million of “non-announced measures” allocated in the 2018-19 budget is now forecast to be $1.75 billion. “I do think this government is pioneering new ways to keep their spending out of the spotlight. It’s not consistent with their commitment to transparency,” he said. “We’re talking about billions of dollars. I’ve very concerned. Governments do need a pillow to address emergency issues. But we’re now reading about $10 billion. It’s very tough to see exactly what they will do with that,” he said. Page, now president of the Institute of Fiscal Studies and Democracy at the University of Ottawa, said there might be merit in the government letting Parliament know in advance that it is planning to adjust the fiscal planning framework for measures to be announced later. In the run-up to a general election, it will allow the government to make spending announcements without having to revise deficit projections upward. But he pointed out it does not create confidence in the budgeting process. No kidding. The basis of the Westminster system is that ministers seek the prior sanction of Parliament, by outlining to legislators what they intend to spend money on. The government will still have to seek approval for spending but the Parliamentary Budget Office is looking into opposition concerns that new expenditures will be mulched into departmental spending, making it harder to reconcile down the road. It certainly does not make following the money any easier. That, at the end of the day, may be the purpose. The Liberals have a fiscal conundrum. Any credibility they have on managing the public finances rests on the federal debt-to-GDP number ticking downward over the next five years. According to the government’s figures it does just that — going from 30.9 per cent this year to 28.5 per cent by 2023-24. Yet that rosy projection relies on the Liberals constraining direct program expenses (and thus deficits) over the next five years. The fall statement suggests total direct program expenses will rise from $149 billion in 2018-19 to $161.1 billion in 2023-24 — a 7.5 per cent increase over five years. But this is a government that has increased spending by 22 per cent during its three years in office. The fiscal update says program expenses as a percentage of GDP will fall from 6.7 per cent to 6 per cent. That’s an austerity drive that would make Stephen Harper proud. Any takers should stretch their credulity still further and join the crypto-zoologists in their hunt for hidden animals. A footnote is the only hint, suggesting the provision is for “anticipated Cabinet decisions not yet made and funding decisions related to national security, commercial sensitivity, trade agreements and litigation issues.” "
Wow, looks like Justine grasped the nettle and really stumped-up some cash for a first tranche of F/A-18A airframe life-extensions. Keep them under +3.8G and -2.2G, and they should be good to 2030. Bringing this food fight over to the Canadudes thread. Keeping the mud out of Australia ! ChippyHo wrote: Pity that you weren't taught any common sense - if you have to be taught about a sense of humor .... well the jokes on you!! I knew I needed to put this on the Canadudes thread. Respect for the thoughtful and ( )polite answer. Look I happen to agree - our PM is a useless juvenile and NO i didn't vote for him or his party. Be that as it may - i color most politicians the same color - useless. That does not give people a carte blanche to poop on the country. I have always felt that we Canucks could learn to be more like our Yankee cousins and be much more visibly patriotic.Ya we need to wave the flag more than at just hockey and curling tournaments!!! I've answered the 'ChippyHo' accusation in the original Oz thread where it is in context with the other stuff not relevant. Because when you can’t carry out training exercises, you really can’t carry out missions. Its worse when one is training at an outdated range since one would be training in unrealistic conditions. It follows calls for quite time for a range update. I suspect its linked to why this year's maple flag was cut short. Also its not the first time maple flag has been cancelled. Tongue firmly in cheek, I'd opine the RCAF would have preferred to carry on Maple flag if only to see their future fighters in action when the RAAF is in town. The Auditor General’s recent report on fighter pilots leaving the Royal Canadian Air Force sparked a lot of speculation on why that was happening. One of the claims made on social media was the pilots were leaving because the Canadian government didn’t go ahead with the purchase of new fighter jets, specifically the F-35. This seems to be a brilliant piece of marketing by F-35 manufacturer Lockheed Martin and shopped around with glee by F-35 supporters. Unfortunately reality sometimes has a way of shooting down such bogus claims. RCAF commander Lt.-Gen. Al Meinzinger outlined for Members of Parliament recently the real reasons behind the fighter pilots leaving. Not one mention of Canada not having the F-35 or any other new fighter jet. The geographic location aspect has played into retention issues affecting other organizations supporting the RCAF. 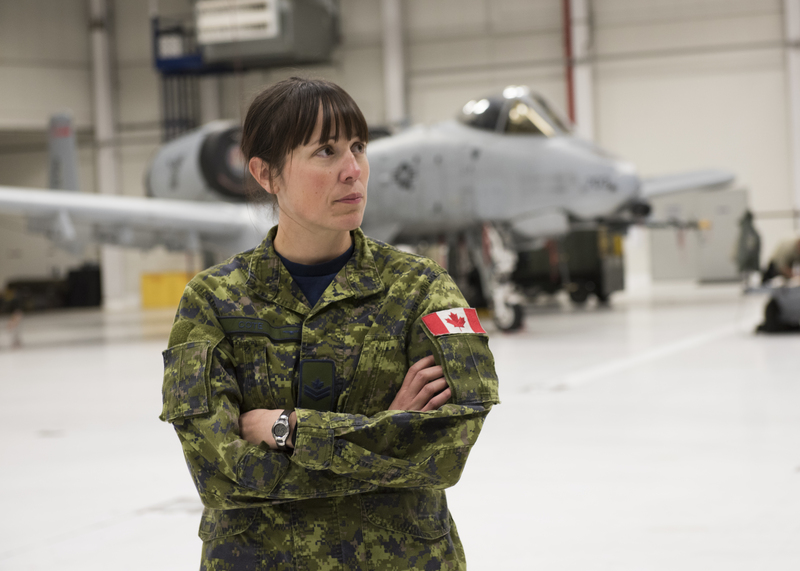 The federal government will create a new centre of excellence in Ottawa to support aircraft testing, a move that affects the Canadian military’s Aerospace Engineering Test Establishment, or AETE, which has been at Cold Lake, Alta. since 1971. Under the new plan AETE would be relocated to the international airport in Ottawa and partnered with the National Research Council Flight Research Laboratory and Transport Canada Aircraft Services Directorate to create a centre of excellence for flight testing and evaluation. Moving AETE will save $14 million a year and free up space for the arrival of more fighter jets at Cold Lake. But defence industry officials were briefed earlier on one of the other aspects behind the move. That involves the difficulty in attracting civilian researchers and trained support staff to Cold Lake and retaining the military personnel that were transferred there. A move of the facility to a larger centre, less isolated and where spouses can find employment, is expected to help solve recruitment and retention issues for this organization. Stupid pug. Pilots aren't leaving because the F35 wasn't selected, they are leaving because Canadah can't make up their minds.